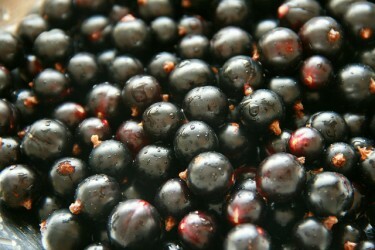 Black currant oil is an unusually powerful nutritional oil with many health benefits. Ahead is how the gamma linoleic acid and other nutrition in black currant seed oil may help treat and prevent thinning hair, the best dosage for hair loss and other potential benefits of black currant oil. Androgenic alopecia is a form of hair loss that can affect both men and women. In men the condition is also known as male pattern baldness and leads to a receding hairline, loss of hair on the crown and eventual baldness. For women, androgenic alopecia is characterized by thinning hair over the entire scalp, with usually the worst hair loss in the crown region. There are many factors that can contribute to losing your hair, but a deficiency in certain important fatty acids is a common one. Here’s where taking high quality black currant oil capsules like these can help. The seeds of black currants are extremely rich in 3 valuable fatty acids for healthier hair and better health in general. Black currant seed oil like this contains high levels of gamma linoleic acid, alpha linolenic acid and stearidonic acid. Let’s have a quick look at each of them. Black currant oil is one of the richest known sources of gamma linoleic acid, also called GLA, with up to 20% content. This fatty acid has powerful anti-inflammatory properties and is often recommended for health conditions resulting from inflammation like arthritis. In terms of hair loss, the GLA in black currant seed oil can inhibit the change from testosterone to dihydrotestosterone (DHT) by way of the 5-alpha-reductase enzyme. Excessive dihydrotestosterone in your body can attack hair follicle and by blocking DHT production, black currant oil may help prevent further hair loss due to androgenic alopecia in both men and women. Pumpkin seeds are another natural and powerful DHT blocker, well worth adding to the diet of anyone concerned about their hair. There’s much more on how to use raw pumpkin seeds for hair loss and prostate problems here. The anti-inflammatory effects of black currant seed oil are also greatly enhanced by its high alpha linolenic acid (ALA) content, usually between 12% and 15%. ALA is an essential omega-3 fatty acid, yet dietary intake of omega-3s has diminished greatly in recent decades with our increased intake of processed foods, virtually devoid of this vital nutrient. Omega-3 fatty acids like the alpha linolenic acid in black currant oil are a precursor to anti-inflammatory series 3 prostaglandins. They specifically counteract inflammatory series 2 prostaglandins formed from processed omega 6 fats, like those found in processed vegetable oils and margarine. This is particularly important for people with thinning hair as prostaglandin D2 (a series 2 prostaglandins) has recently been identified as a likely contributing factor in accelerated hair loss. Getting good levels of omega-3 fats into your diet, and importantly lowering your intake of omega-6 fats from processed vegetable oils, should help get the balance right between pro-and anti-inflammatory prostaglandins. There are many more health benefits of omega-3 fatty acids for your skin, hair and general health and well-being in the articles on flaxseed oil on Superfood Profiles, the richest natural source of ALA. Taking a high quality fish oil for its concentrated EPA and DHA omega-3 is also highly recommended for preventing hair loss. A lesser-known omega-3 fatty acid, stearidonic acid is also involved in mediating your body’s anti-inflammatory responses. While we can make stearidonic acid inside our bodies (and indeed gamma linoleic acid) with the delta-6-desaturase enzyme, levels of this enzyme are generally greatly reduced as we age and with modern unhealthy diets. This makes supplementing with a high source of GLA, ALA and stearidonic acid like black currant oil a smart choice, especially if your body is showing signs of deficiency in these fatty acids, like thinning hair and poor skin tone. The most common recommended dosage for taking black currant oil is two 500 mg capsules twice a day, once with breakfast and once with dinner. However, many report even better and faster results with three capsules equaling 1500 milligrams in total per day, ideally one with every main meal. Like all nutritional treatments for hair growth, it can take a while to see full results simply because hair itself takes so long to grow. Generally, taking a high GLA black currant oil like this one would help reduce further hair loss quickly if fatty acid deficiencies were contributing to the problem. Even so, it’s likely to be at least a month, more often two or three months before results can be seen clearly. An improvement in your skin’s appearance is more likely to be noticeable first, particularly if you are deficient in gamma linoleic acid or omega-3 fats. This is due to how quickly skin cells regenerate compared to hair follicles. The high levels of beneficial fatty acids in black currant seed oil like GLA, ALA and stearidonic acid can have many other benefits for your health. Here’s 3 of the best. Your skin is also highly sensitive to a deficiency in important fats, particularly omega-3 fatty acids. Taking black currant oil is often reported to help with inflammatory skin diseases like acne, eczema and even psoriasis. Additionally, gamma linoleic acid is involved in melanin production and may help normalize pigmentation problems like age spots and uneven skin coloration. Your brain is highly reliant on omega-3 fats and increasing your intake has been shown to have a beneficial effect on a variety of different brain related conditions. These can be as wide-ranging as mood and stress reduction, treating learning disorders in children, reducing migraines, lowering the risk of Alzheimer’s and improving the quality of your sleep. A good fish oil, like this orange flavored one from Norway that I take, is an even better source of omega-3 fatty acids, but black currant seed oil is still a high source. As already detailed above, ALA, GLA and stearidonic acid can contribute to reducing excessive inflammation response in your body due to a high intake of unnatural omega-6 fats found in many processed foods. The effects of lowering inflammation within your body can be quite profound as most diseases that we think of as completely unrelated, whether arthritis, heart disease, Alzheimer’s, skin complaints or thinning hair are all essentially diseases of inflammation. Unhealthy diets and lifestyles are behind excessive inflammation and no one supplement can prevent all of these problems. But black currant seed oil is rich in the right kind of fatty acids to help swing the balance back a bit further in the right direction. If you’d like to try black currant oil for hair loss and thinning hair or some of the other health benefits discussed here, this is the best version I’ve found. It’s produced without the solvent hexane and uses the much superior cold pressing method. Not many people have heard of black currant seed oil before so please share this information with your friends. You might also like to try this smoothie recipe for hair growth that combines many different superfoods for hair, including black currant oil, into a delicious drink. Correcting simple nutritional deficiencies can often result in significant improvements. Not just in your appearance with better hair and skin, but also in relation to many other different health conditions. Great article! This is definitely one of the more comprehensive descriptions on Blackcurrant Seed Oil benefits that I’ve seen. There has been some additional research on Blackcurrant Seed Oil for hair loss recently that might also interest you (from French and Italian researchers). This placebo-controlled study showed combining Blackcurrant Seed Oil with Omega-3 fish oil (plus some anti-oxidants – mainly vitamins) helped improve hair density, diameter, and reduced hair loss! (assessed both by a professional and subjectively). The reference for the actual article is: Le Floc’h C, Cheniti A, Connétable S, Piccardi N, Vincenzi C, Tosti A. Effect of a nutritional supplement on hair loss in women. J Cosmet Dermatol. 2015;14(1):76-82.
in combination with other oils. How effective do you think it could be? If effective, what proportions of products would you use and how, how often etc? I think black currant oil would be more effective as a supplement as the gamma linoleic acid moderates DHT and helps prevent hair loss. I haven’t read anything on this effect from topical application, though it would likely be a good, if a little expensive, hair treatment. Personally, I’d use avocado oil https://superfoodprofiles.com/avocado-oil-hair-treatments topically and save black currant oil as a supplement. The GLA is hard to get from other sources. Sorry your comments didn’t appear. I’ve been away and have to approve them manually due to the hundreds of daily spammers. The bottle of Black Currant oil states Omega 3-6. Your article stated “Getting good levels of omega-3 fats into your diet, and importantly lowering your intake of omega-6 fats from processed vegetable oils, should help get the balance right between pro-and anti-inflammatory prostaglandins.” Is this Omega 6 different than the one you mention? There is a difference between the gamma linoleic acid in black currant oil and the chemically altered fatty acids in vegetable oil. While both are classed as omega-6 fats, GLA is considered anti-inflammatory unlike the more common linoleic acid which has usually been heavily processed and heated. Can I do both, Black Current and Flaxseed oils? Hi Tammy. Yes I think this would provide many good nutrients for hair growth and general heath. I was so pleased when I stumbled on this article. Presently, hair loss has become a big issue. I have been treated for extensive psoriasis taking the new biologic drug “Consentyx” The side effects say nothing about hair loss, but I am suspitious. I am also type 2 diabetic – diagnosed 25 yrs. ago. I take insulin and metformin as well as anti hypertensive medications. I believe that they may also contribute to hair loss. It has become increasingly noticeable for the past few months. I was taking my fish oils faithfully, but stopped (no reason). I am going to get back to the supplements immediately and will try to purchase the black current oil and flax seed which I’ve taken before. Presently I am taking Biotin. I need all the help that I can get! I have always been an advocate of eating very healthy (father grew his vegetables organically). I am super disappointed that I have many issues including asthma. Anyway, I just want to thank you very much for the information that you provided! Thanks for your positive comments Monka. I hope black currant seed oil can help with hair loss for you. More healthy fats like the ones you mentioned and definitely less simple carbs like processed grains and sugar would likely help with all of the issues you mentioned. Extremely helpful, have inflamatory bowel disease , should have been taking this along time ago. No they are different. Black seed oil usually refers to black cumin seeds. I have recently started taking black current oil tablets of now brand before my lunch and dinner along with cold pressed virgin coconut oil. I have started getting pain in my knees , particularly in the night. I am 49 years old, having menopause’s 3 years ago. Black currant oil and coconut oil should be beneficial but you can test this by stopping them (and any other recent additions) for a week while keeping your other supplements/diet the same. After a week introduce just one at a time for a week to see if it causes problems. Even if it is fine you should stop it and start the new one for a test. If both are fine then try them together. This takes a few weeks but when there could be problems it’s best to test supplements individually. Can I get the same benefits from drinking 8oz of black currant juice daily as taking the black currant oil? Unfortunately not, the beneficial compounds are in the pressed oil from the seeds. The juice wouldn’t contain them.